Embark on a memorable journey that will unleash the vibrant flavours of Spain. Learn the secrets of making some of the country's best-known dishes using fresh local ingredients. Discover Trevelez, the highest village in Spain and sample their traditional mouth-watering ham. Visit The Cathedral of Guadix, the town famous for its cave houses, and visit the local vineyard for tapas and wine. Why go to Flavours of Spain? Sights, tastes, and smells – all in one tour! To get the full flavour of Spain, we dedicate a day to Spanish culture. Starting with gastronomy the chef at the hotel will teach us the secrets of making some of the country’s best-known dishes and using tasty local ingredients also demonstrates the art of creating amazing tapas. These delightful small dishes of various titbits can be served either hot or cold. After enjoying the fruits of our labour, with a glass or two of sangria, we take a guided walk to the honey museum, a local speciality, before our Spanish theme continues with music and food to match. Olé! Granada is a city brimming with steep, narrow streets and beautiful nooks and crannies. Our day begins with a guided tour of the magnificent Alhambra Palace with its commanding views over the whole city and one of the most famous examples of Moorish architecture. Stopping for a tapas lunch at one of the historic centres taverns, we then have the afternoon free to explore more of this fascinating city. Off the beaten path, in the east of the Granada Province, we find the large bustling country town of Guadix. 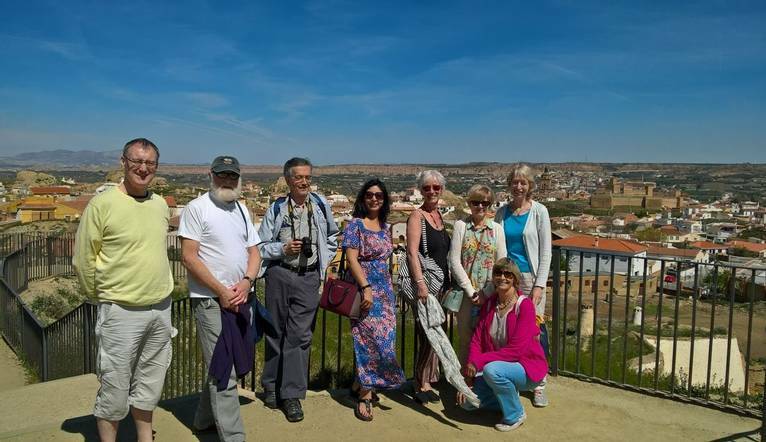 Together we will then visit The Cathedral of Guadix, one of the oldest in Andalucía, The town is famous for its cave houses, with almost half of its inhabitants living underground. It’s then on to a local vineyard for a tasting of 3 of local wines and tapas while finding out about the wine making process and the differences between them. The unspoilt region of Las Alpujarras is peppered with the stunning white villages full of history and tradition that rural Spain is known for. Discover the charms of Pampaneira, Capileira and Bubión before heading to Trevelez, the highest village in Spain. Here we have a chance to sample some of the villages’ mouth watering cured ham. Finish the day with a flamenco show; the dance of the gypsies with traditional rhythmic music. Excellent food and traditional hotel with a good sized room and bathroom. Good excursions and got to experience a true flavour of Spain. Nice local, family run hotel with a real Spanish feel about it. Excellent food too. All the Spanish experiences were very enjoyable and interesting. It’s quite a hectic programme of events with little time to yourself, but when you're a solo traveller, I don't think that is a bad thing. Would thoroughly recommend this trip to anyone. Good excursions and got to experience a true flavour of Spain. We certainly got to taste all the flavours of Spain and learn about the beautiful part of Spain. Wonderful group and local guides were excellent as well. The transfer from Malaga Airport to Hotel Alcadima is approximately 2 hours depending on traffic and local conditions. We suggest a Group Collection to cover guides, transfer drivers, and hotel staff of minimum £20.00 per person. Your Tour Leader will collect this on your behalf and distribute it accordingly, thus relieving you of the burden of who, when and how much to tip. The tipping of housekeeping will be left to your individual discretion (a small amount left in your room on departure should cover this and would be much appreciated). As is customary, ‘the hat’ will be passed around for the driver and guide on all optional excursions. For any meals that are not included in your itinerary, or taxi fares, your Tour Leader can advise of an appropriate % to add on.